Thrill, terror, and sheer excitement await Magdalena and the rest of the gang as they venture into another fantasy fiction thriller written for middle grades up through young adulthood. Magdalena Gottschalk: The Slippery Slope, book #2 of the coming of age series, blends suspense, intrigue, and supernatural haunts while incorporating preteen life lessons of friendship, courage, communal responsibility, and loyalty. Balancing the enchanted world hidden behind the treacherous terrain of the wintry slippery slope and the everyday life within their small, quaint town of Lily Brooke, MALB (The Mystical Alliance of Lily Brooke), realizes that Christmas is a week away. All of the holiday festivities are about to begin, and they are unexpectedly thrown into a battle of good versus evil. Will the friends be trapped in The Enchanted Forest? Or, through teamwork and faith, will they make it back home in time to celebrate the most special time of the year? 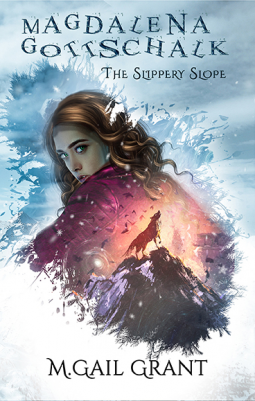 "M. Gail Grant’s action and adventure fantasy story for preteens, Magdalena Gottschalk: The Slippery Slope, is an exciting and fast-paced tale which follows the six young teens as they explore the Enchanted Forest and seek a way out of Queen Lindtzl’s booby-trapped castle. I was especially impressed with the strategies Magdalena and her friends use during their adventure and the way the six of them work as a team. Grant’s world of Lily Brooke and the Enchanted Forest is inspired, especially when seen in contrast, as the bucolic little town is such a difference from the supernatural world the forest represents. This story also works quite well as a coming of age tale as each of the characters adapts to the seriousness of their situation and masters fear and insecurity to help the other MALB teammates. Grant’s plot is sound and great fun to follow, and her characters are well-defined. Magdalena Gottschalk: The Slippery Slope is most highly recommended." "The eye-catching cover complements the story and Grant’s prose is as charming as ever. The narrative is vivid, the dialogue is clean, and the moderate pace suits the plot well. That said, the beginning chapters may seem slow for readers who haven’t read the first book of the series, The Crooked Trail. There are enough details from its predecessor to give an idea how the story picks up from where it left off. On the other hand, reading the first book will give readers a better grasp of the dark subtlety of the premise. The characters’ development is deftly done and this definitely helps with the depth and the continuation of the story line. The MALB members show the strength of their friendship once again, as well as bravery and quick thinking. On the whole, The Slippery Slope is an entertaining and well-targeted fantasy for its intended young readers." "By chapter four the reader is thrown into an action-packed adventure with this group of friends. It was a good story and I think that it could be very well received in the pre-teen age group. If this was available in my 12 year-old son’s school library, I’m sure it would be one that he would want to read. I believe that if elementary school librarians gave this series a chance that it would be well received by young readers. I’ll be looking to purchase these books for my son. Well done!"